Located in the Appalachian Mountains, this state park offers many recreational opportunities. The 42-acre man-made freshwater lake offers swimming, sunbathing, boating and fishing opportunities. There are also hiking trails which meander through a variety of wildlife habitats and afford a view of the area's geological history. Picnic tables, grills and playgrounds are available in the day-use area. A portion of the Appalachian Trail enters the eastern edge of the park on Bartman's Hill. Features available include: bath house, camping, hiking, food and drink, hunter parking, park office, playground, restrooms, swimming and a visitors center. In Washington County, four miles east of Boonsboro and 1 1/2 miles north of Alternate Route 40 on Monument Road, Washington Monument State Park is named for the first monument in the country erected to the "father of our country," George Washington. 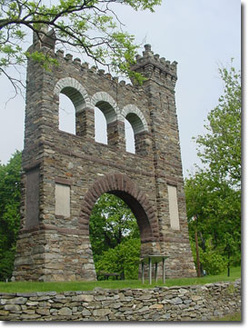 A rugged stone tower was dedicated to the first president by the citizens of Boonsboro in 1827. Washington traveled through Western Maryland in his early years as a surveyor. The Appalachian Trail winds through this park and passes the base of the monument. There are youth group campsites available by reservation. The park offers picnic shelters, playing fields and superb bird watching since the Cumberland Valley is a migratory bird flyway. An annual count of migrating hawks and eagles is made at the monument by bird enthusiasts. Features available include: Hiking, park office, parking, picnicking, playground, restrooms, shelters, Washington Monument and Youth Group camping. 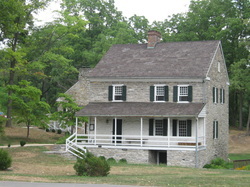 Gathland State Park was once the mountain home of George Alfred Townsend, a Civil War journalist. It is the site of a unique collection of buildings and structures that he designed and constructed, some of which have been restored. A large, stone monument dedicated to war correspondents is an outstanding attraction at this day use park. The Appalachian Trail traverses the park and passes the monument base. Maryland has 41 miles of the interstate hiking trail. The park includes all of Crampton's Gap, which was the southern most gap fought over during the battle of South Mountain. Fought September 14, 1862, it was the first major battle of the Civil War fought in Maryland. Features available include: Memorial arch, hiking trail, parking, picnicking, restrooms, visitor center. Cunningham Falls State Park, located in the Catoctin Mountains, is known for its history and scenic beauty, as well as its 78-foot cascading waterfall. 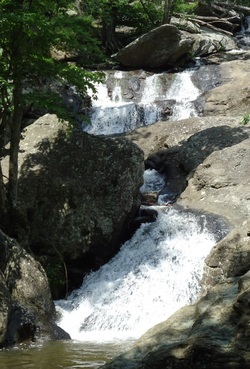 The Falls are located one half mile from the lake in the Houck Area via the Falls Trail. Before the first Europeans arrived, many small Native American tribes farmed, hunted and fished the area. Tradition says the name Catoctin came from the tribe, the Kittoctons, who once lived at the foot of the mountains near the Potomac River. By the time the settlers began to arrive in the Monocacy River Valley, Native Americans were seldom seen. Early settlers used timber from the forests to make charcoal to fuel the Catoctin Iron Furnace. Due to many years of clear-cutting and unscientific farming practices contributed to the overuse and destruction of the land. In 1954 the area was divided into two parks, divided by Maryland Route 77. The northern 5,000 acres is now Catoctin Mountain Park, a unit of the National Park Service. The remaining 5,000 acre parcel was named Cunningham Falls State Park. Located in the Catoctin Mountains, is known for its history and scenic beauty, Catoctin Mountain Park is overseen by the National Park Service. Catoctin Mountain Park is best known for the Presidental Retreat Camp David which is within the parks boundaries. Please note that Camp David is closed to the public and that the park may be shut down for security reasons during a Presidential visit. With 25 miles of trails winding through Catoctin Mountain Park a variety of experiences are available ranging from easy to strenuous, many leading to outstanding scenic vistas. The roads of Catoctin Mountain Park offer scenic driving all year; but, portions of Park Central Road and Manahan Road are closed in winter. Camping, picnicking, wildlife viewing, fly-fishing, cross country skiing are all available at Catoctin Mountain Park. The site of Maryland's frontier defense during the French and Indian War (1754-1763), the Fort's stone wall and two barracks have been restored to their 1758 appearance. Historic displays are in the Fort, barracks and Visitor Center. The park annually holds military reenactments and other special events. Park lands adjoin the Potomac River and the Chesapeake and Ohio Canal passes through park acreage. Tours are available by request. Daily Living History programming is available from Memorial Day through Labor Day and on weekends in the spring and fall. 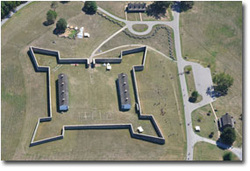 Fort Frederick saw service again during the American Revolution as a prison for Hessian (German) and British soldiers. In 1791, the State of Maryland sold the fort. For the next 131 years, the fort and surrounding lands were farmed. 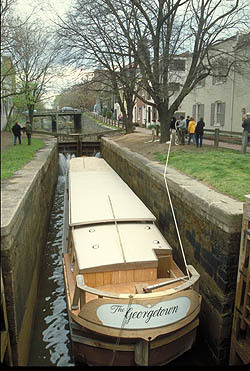 During the Civil War, Union troops were often stationed around the fort to guard the C & O Canal. In 1922, the State of Maryland repurchased the fort. Through-out the 1920's, the State began development of Maryland's first state park. During the Great Depression of the 1930's, a company of the Civilian Conservation Corps was assigned to the park to reconstruct the dilapidated stone wall, perform archaeology and locate the foundations of the original interior buildings. Restoration continued in 1975. Future plans include reconstruction of the Officer's Quarters and other defensive works. Features available include: Boat launch, camping, concessions, fishing, Fort Frederick, hiking trail, parking, picnicking, shelters, visitors center and youth group camping. The park is open during daylight hours. Some of the park's six visitor centers operate on a seasonal schedule. Contact one of the visitor centers for current hours of operation. 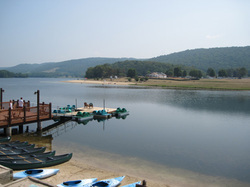 Rocky Gap State Park encompasses over 3,000 acres of public land for guests to enjoy. Rugged mountains surround the park which features 243-acre Lake Habeeb. The lake is fed by Rocky Gap Run which winds its way through an impressive mile long gorge displaying sheer cliffs, overlooks and a hemlock forest dense with rhododendron. 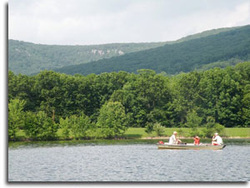 Overlooking the lake is Evitts Mountain, named for one of the first European settlers in Allegany County. Features available include: Bath house, boat launch, boat rental, camp store, camping, Evitt's homesite, fishing, hiking trails, park office, shelters and swimming. The Bloodiest One Day Battle in American History, 23,000 soldiers were killed, wounded or missing after twelve hours of savage combat on September 17, 1862. The Battle of Antietam ended the Confederate Army of Northern Virginia’s first invasion into the North and led to Abraham Lincoln’s issuance of the preliminary Emancipation Proclamation. The Battle of Antietam was part of what is known as the Maryland Campaign of 1862. Joining a Ranger program, driving, hiking, and biking are just a few of the ways to experience the battlefield. Start at the park visitor center which includes two films, exhibits and a museum store. Rohrbach Campground is part of the Antietam National Battlefield. It is a walk-in, primitive camping area available to Scouts and other organized groups, and is open each year from March 1- November 30. In addition, the Scouts can do a 10-mile hike on the battlefield and earn a patch. For patches, the guidebook and information contact the ANB museum store at (301) 432-4329 or purchase them on the new ANB online bookstore. The campground has 10 sites, each of which is provided with a fire ring and picnic tables and space to accommodate a maximum of 30 people. Located on High Rock Road at the Mason-Dixon Line, this site was selected in 1871 by Colonel J. M. Hood of the Western Maryland Railroad and approved by the WMRR directors as the location for the development of an amusement park. After the acquisition and clearing of the land, the area was developed for the proposed park, including the building of a pavilion and a dining hall. Attractions in the park include a scenic lookout, picnic shelter, children's playground and multipurpose pavilion have been reconstructed on their original sites. The locations of former attractions are identified with numbered markers. 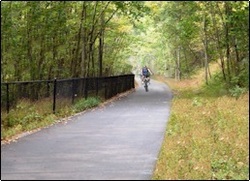 The WMRT is a 20+ mile asphalt paved trail that follows the bends and curves of both the C&O Canal and the Potomac River. The WMRT is perfect for hiking, biking, inline skating (roller blading) or weather permitting, cross country skiing. And it's handicap accessible. From Hancock, Maryland, the trail travels 10 miles to the east to about 1/2 mile from Fort Frederick State Park and another ten miles to the west to Polly's Pond (a small body of water where canal boats would winter). The trail is especially suited to families, novice cyclists (it's almost completely flat), and for anyone seeking a pleasant, leisurely ride. 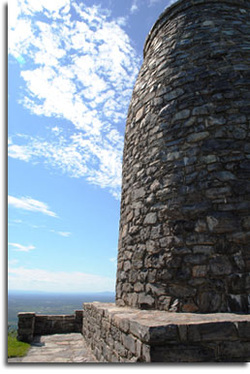 Discover ruins of old Civil War forts and campsites and savor the spectacular views. From The Point in Lower Town (where the Potomac and Shenandoah rivers meet) to the Overlook Cliffs is 4.2 miles round-trip. From The Point to the Stone Fort is 6 miles round-trip. 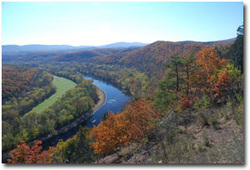 The Combined Trail is marked with green blazes; the Overlook Cliff Trail is marked with red blazes; the Stone Fort Trail is marked with blue blazes. There is no water supply and no restrooms on Maryland Heights. The trails include some strenuous uphill sections. 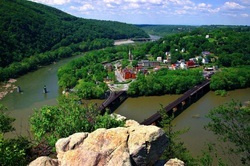 Maryland Heights is part of the Harpers Ferry National Historic Park run by the National Park Service. This thirty acre natural area, located along Millbrook Road off Mary-land Route #67 near Rohrersville, contains approximately one mile of floating boardwalk which meanders through one of Maryland's most unique non-tidal wetlands. The size of this wetland, believed to be among the best in this geographic region, makes its protection important not only to wildlife, but to humans interested in the preservation of non-renewable resources for nature and scientific study. The wetland is a wonderful location for watching birds and animals. In order to safe-guard the wetland, the entrance gates are open by appointment only. Walk-in traffic is permitted. Devil's Backbone is the second oldest of Washington County's parks. This nine acre park includes a footbridge across the Antietam Creek, which divides the park, providing access to the "island" section of the park as well as to a nature trail which ascends to the summit of the ridge from which the park takes its name. 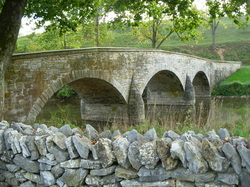 The park also offers fishing and an access for canoes to the Antietam Creek. Since 1982, Cedar Ridge Adventures has offered quality adventure programming services to all ages throughout the Quad-State area. Accredited since 1993 with Project Adventure, Inc., CRA’s professional staff have challenged thousands of participants to achieve personal growth over the years. Goal setting, team building, decision making and problem solving are just a few of the topics their highly trained challenge course facilitators incorporate into each day's experience. 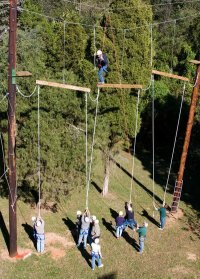 Whether at the Cedar Ridge Adventures Challenge Course near Williamsport, Maryland, or bringing the adventure to you through their portable initiatives, let them custom-tailor a challenge course experience for your students, residents, church youth, scout troop, civic club or employees. The Hagerstown Ice & Sports Complex at Fairgrounds Park is a 40,500 square-foot facility sitting on nine acres adjacent to Fairgrounds Park. The facility is owned by the City of Hagerstown and operated by the Hagerstown Youth Hockey Association. The complex features a single National Hockey League size rink, an arcade, snack bar and rooms for parties or private meetings. Fairgrounds Park (formerly known as Hagerstown Fairgrounds) is an open land park restored from fairgrounds located off Cleveland Avenue in Hagerstown, Maryland. The park is home to Hagerstown BMX, a biking track, Hagerstown Ice & Sports Complex, a public in-door ice skating complex, and Hagerstown Fairground Softball Association who play at softball fields on the premises. Fairgrounds Park also features walking trails. The Hagerstown Roundhouse Museum is dedicated to the preservation of our railroad heritage and to the men and women who worked for the railroads and made Hagerstown the Hub City. The collection of histori-cal equipment includes the #132 Diesel-Electric Locomotive built by the Baldwin Locomotive Works in Philadelphia, PA in 1944, two Western Maryland cabooses built in the Western Maryland shops during the 1930’s, and Hagerstown & Frederick trolley #168 built in 1918. The Museum is filled with artifacts, photos, rail-road art, model railroads, a library, a roster of Western Maryland employees, and a gift shop. There is something for everyone at the Museum. There are trains for kids to run and specials events include the Trains of Christmas and Railroad Heritage Days. A small admission price is required. Situated in Hagerstown's City Park, the Hager House is built of uncut fieldstones carefully fitted by the young German immigrant who had traveled to the wilderness of Western Maryland in search of adventure and possible fortune. Jonathan Hager had arrived on the shores of the new colonies in 1736, debarking at the Port of Philadelphia. Eventually, he chose to make his home in Maryland, where Charles Calvert, proprietor of the colony, was offering cheap land to those willing to settle in the western frontier. Hager has been called the "Father of Washington County" due to his having laid the groundwork for its separation from Frederick County in 1776 and the subsequent creation of Hagerstown as a city. Throughout the year, the Hager House sponsors a variety of activities and special events focusing on aspects of eighteenth and nineteenth century life. A small admission price is required. A wide variety of events are held at the facility such as the Washington County Ag Expo, Mason Dixon Dog Show, Antique Tractor Show, Farm Toy Show, MiHi Craft Show, Pygmy Goat Show, Car Show for Children, Sales and many other Community Activities. The Rural Heritage Museum is located on the Ag Center Grounds. It is open April through October, Saturday and Sunday from 1pm to 4pm. The park includes approximately 1 mile of shoreline on this, Maryland's largest man-made lake. Access is available for fishing, swimming, and boat launching. Several picnic areas offer excellent views of the lake with easy access to the beach and other facilities. Interpretive programs, consisting of evening campfire programs, and talks and hikes on the natural and cultural resources of the park, are led by a park naturalist and are available at various times throughout the year and by special request. Meadow Mountain campground has 112 campsites that are available by reservation from the spring through the fall. The boat launch facility is open most of the year except when winter weather or ice conditions prohibit access. Fishing is generally good on the lake with stocked trout, walleye, bass, and yellow perch being the most abundant. Meadow Mountain offers opportunities for hiking. Trail difficulties range from moderate to difficult. A trail guide is available at Park Head-quarters and at the Discovery Center or you may purchase one online. Four season opportunities exist for mountain biking, cross country skiing & snowmobiling. Nestled along the shores of Deep Creek Lake at Deep Creek Lake State Park, the Deep Creek Discovery Center is an educational/interpretive center for people of all ages to enjoy and learn. Through hands-on exhibits that showcase the natural resources of Western Maryland, families can learn about the flora and fauna, wildlife, cultural and historical heritage that have turned this former logging and coal mining region into a popular modern day vacation destination. 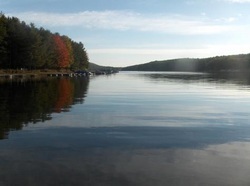 Features Include: Boating, snowmobiling, camping, fishing, swimming, hiking, picnicking, biking, and visitors center. 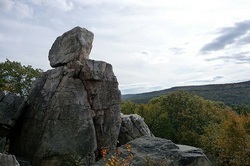 Three native stone overlooks, strategically located on the 1600-foot summit of High Knob, midway between the Mason-Dixon Line and the Potomac River, offer excellent and exciting views of the surrounding area. 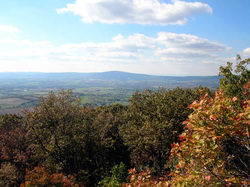 On a clear day, looking north, a visitor can see the rugged tree-covered mountains of the Frederick City Municipal Forest, one of the State's best managed watersheds. Looking south, one can see Crampton's Gap, a Civil War Landmark and the site of Gathland State Park, and the Middletown and Monocacy Valleys. South Mountain, where many engagements between Confederate and Union troops took place during the Civil War, can be seen to the West. Two separate areas of Gambrill State Park provide recreational facilities and activities for visitors of all ages. The Rock Run area is located at the park entrance. The High Knob area is located at the top of Catoctin Mountain. Features Included: Picnic areas, shelters, camping, hiking and nature trail, and interpretive program. 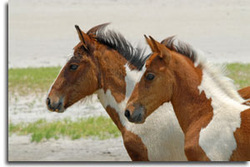 Assateague State Park is Maryland's only ocean park. It is located on Assateague Island, a barrier island bordered on the east by the Atlantic Ocean and on the west by Sinepuxent Bay. Two miles of ocean beaches offer swimming, beachcombing, sunbathing, surfing and fishing. The island's bayside offers visitors the chance to explore secluded coves by canoe or kayak. The marsh areas have a variety of wildlife, including deer, waterfowl and feral horses. Assateague was selected by National Geographic Travel magazine in 1994 as one of the 10 best state parks in the United States. Features Include: Bike trail, boat launch/marina, nature programs, camp sites, swimming, fishing, nature center, and kayak rentals. 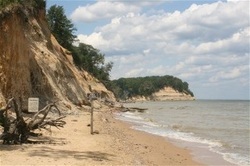 The cliffs which dominate the shoreline of the Chesapeake Bay for thirty miles in Calvert County, were formed over 15 million years ago when all of Southern Maryland was covered by a warm, shallow sea. Over 600 species of fossils have been identified from these cliffs, with the teeth of various species of shark as the most abundant fossils. The park is 14 miles south of Prince Frederick on Maryland Routes 2 and 4. Along with the interesting cliffs, the park offers nature trails, picnic areas, playground equipment, fishing and many interpretative programs. 1079 acres of the park are designated as a wildlands area. Approximately 550 acres are open to hunting for upland game, turkey and deer. Features Include: Fishing, hiking trails, historic interest, hunting, picnicking, youth group camping, playground, shelters. Maryland’s second largest state forest consisting of 46,000 acres in the Ridge and Valley Province of the Allegheny Mountain chain. The region’s average annual precipitation is the lowest in the state just 36 inches– creating pockets of prairie like habitats known as shale barrens. Unusual plants, like Prickly Pear Cactus, Large Blazing Star and Kate’s Mountain Clover are found here. The unique plant and animal diversity of the forest is preserved in several designated areas of State Wildlands. The park offers a system of one-day hiking trails, also target shooting is permitted on the Green Ridge Public Range. Features available include: camping, hiking, fishing, rifle range, boat ramp, horse area, mountain biking, hunting, canoeing and C & O Canal access.